FOOD SAFETY: ANIMAL BONE HEAPS IN BISCUIT FACTORY. It may be a little difficult to digest but nonetheless its true. 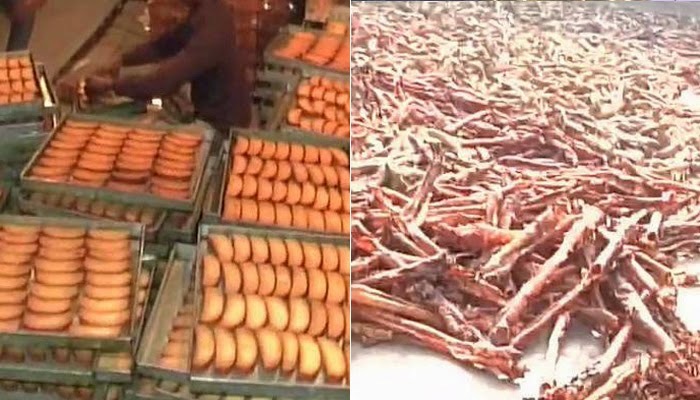 The Food Safety Department recovered heaps of bones from a biscuit and rusk factory located in Katghar area of Moradabad, Uttar Pradesh, while conducting raid recently. They have conducted the raid on some inputs and have recovered heaps of bone. The factory was also indulging in child labour. The well known food factory is situated on Rampur road. The authorities subsequently cancelled the licence of the factory. The raiding team sealed the factory and the samples which were collected were sent to the state laboratory.Reports said that animal bones were allegedly being used for making eatable products. Reports also said that the owner of the factory could face a jail term and a fine of Rs five lakh if tests confirmed adulteration or presence of ingredients which were unsafe for human health. 15 children were reportedly rescued from the factory premises The district labour inspector was summoned by the raiding team after children were found working in the factory. A very important information and message to the public.